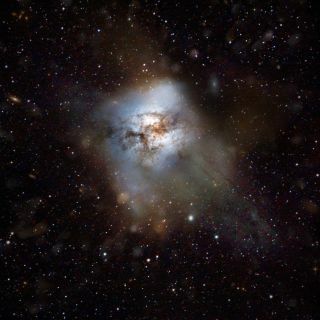 Artist's impression of a starburst galaxy similar to the distant HFLS 3, which was churning out stars at a record-setting pace less than a billion years after the Big Bang. Astronomers peering into the early history of the universe have spotted perhaps the most productive star-forming galaxy ever found. Known as HFLS 3, the young galaxy churns out about 3,000 new stars each year — more than 2,000 times as many as the Milky Way averages, and up to 20 times more than the number created by similar galaxies today. "One of the big surprises was how evolved this galaxy is in terms of its properties," principal investigator Dominik Riechers of Cornell University told SPACE.com by email. Astronomers used an array of instruments to analyze HFLS 3. The background image shows the region the young galaxy is located in. The upper-left insert combines radio, millimeter and submillimeter images of the galaxy, while the top right insert shows radio emission from the carbon monoxide molecules taken by the VLA. Starburst galaxies exist today, burning through their stores of dust and gas to produce stars at a fantastic rate. But HFLS 3 is 15 to 20 times larger, and produces 15 to 20 times more stars, than similar current galaxies. The difference is in the dust. Early in the history of the universe, when less dust had been converted to stars, galaxies such as HFLS 3 had access to more raw materials. "The same processes are involved, but just 'supersized,'" Riechers said. One of tens of thousands of early starburst galaxies detected by the European Space Agency's Herschel Space Observatory, HFLS 3 attracted attention because it appeared very red among the rest, which indicated the possibility of greater distance. Riechers and a team of international astronomers used a suite of instruments from around the world to study the distant structure. "Finding this galaxy was like looking for a needle in a haystack," Riechers said. Although light travels at an extremely rapid pace, it still takes time to cross vast distances. When astronomers examine an object at a great distance, they see it as it was when light left the source, rather than the way it looks today. Because it took about 12.8 billion years for HFLS 3's light to reach us, astronomers know they are seeing the galaxy when the universe was only about 6 percent of its current age. The galaxy itself would have looked very different from the Milky Way to hypothetical contemporary observers. While our skies are mostly clear, the center of our galaxy is shrouded in dust and gas, making it impossible to peer through. "In this new early starburst galaxy, our sky would look like this in pretty much every direction we looked," Riechers said. The high rate of stellar formation would give rise to more young blue stars, and supernovae, the explosive death of stars, would be thousands as time as common. "It would make our own galaxy look like a fairly boring place in comparison," Riechers said. But the dusty sky won't last forever. With its rapid stellar creation, it won't take long for HFLS 3 to burn through its dust and gas. "If the galaxy keeps going at full speed, it can consume all of its vast gas reservoir in only about 36 million years," Riechers said. That's short on astronomical time scales, only a tiny fraction of the lifetime of the galaxy. Eventually, the galaxy will calm down, forming only a handful of stars each year until it acquires more gas, either from its environment or by merging with another galaxy. Over its lifetime, it is likely to have undergone several bursts of stellar production, followed by dry periods. "One way or another, the starburst is not going to last forever," Riechers said. The research was published online today (April 17) in the journal Nature. Although dust and gas were more plentiful soon after the Big Bang, starburst galaxies like HFLS 3 were extremely rare before star formation picked up. According to Riechers, they were at least 10,000 to 100,000 times less common than "normal" galaxies early in the history of the universe. Over time, they became more plentiful, but as dust supplies depleted, they again became more scarce. Part of the reason for the rarity is because it takes time for large-scale structures to form. "Models predict that the most massive, most intensely star-forming galaxies can only form once a certain time has passed," Riechers said. Pinning a date on HFLS 3 helps astronomers understand more about galactic growth and evolution over time. Comparing the early starburst galaxy to later, similar structures can also reveal any changes in their properties, researchers said.